Jonah and Brighton are about to have the most awkwardly awful night of their lives. For Jonah, every aspect of his new life reminds him of what he has had to give up. All he wants is to be left alone. Brighton is popular, pretty, and always there to help anyone . . . but has no idea of what she wants for herself. Her seemingly perfect life is marred only by Jonah, the one person who won't give her the time of day, but also makes her feel, well, something. So when they are repeatedly thrown together over the course of one night, anything can-and does-happen. Told in alternating chapters, this poignant, beautiful novel's energy and tension, amidst the humor and romance, builds to a new beginning of self-acceptance and hope. I received this book from Bloomsbury Australia and knew absolutely nothing about it. So I read the blurb and decided it sounded interesting. Not to mention that the cover's lovely. Jonah has been the new kid in school for a while now. He keeps to himself and refuses to socialise with anyone. No matter how hard the other kids try to include him, he always assumes the rich snobs of Cross Pointe look down on him because he's from Hamilton. So he lives his school week in a daze that includes ignoring a girl called Brighton--who is always trying to include him in school activities--tolerating his mother and her new husband, while spending time with his baby sister, and wishing the time away until he can go and hang out with his girlfriend Carly in Hamilton. Brighton is the kind of girl that everyone likes. She goes out of her way to help others by taking part in just about every activity she can squeeze into her life. She's also a 'yes' person who puts others in front of her no matter how she's really feeling. And if she lets even a little of her own needs slip through, she feels bad about it. She wants everyone to like her but not because she's an attention seeker, it's because this is the only way she knows how to impress her father. Especially since the anniversary of his passing is fast approaching. The afternoon she usually spends with her mother getting a manicure soon leads into a babysitting job that ends up in the house of the one person who's never got time for her. Brighton wants to include Jonah in activities, for both selfish and selfless reasons. And now that she's babysitting his sister, she might get a chance to really get to know him. Except, when he gets home he's super cranky and takes everything out on her. But no matter how much he tries to push her away, she insists on getting closer and the two spend a bizarre night together that changes the way they look at each other, their towns, and life. This story is told in the alternating POVs of both Jonah and Brighton, so we get a glimpse into not only what each one is thinking and feeling, but also how much they hide from each other and the world. Jonah is a very hard character to like. He's whiny, frustrating, annoying, and self-involved. No matter what he thinks of himself he just isn't a nice guy. I would go as far as calling him mean, because some of the situations he puts Brighton in are just awful. Brighton was a lot easier to relate to. She's a nice girl who wishes for independence but is afraid to step out of her safety zone in case others won't like her. 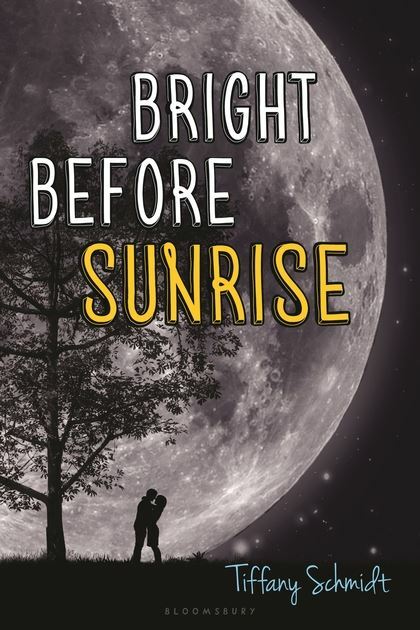 Bright Before Sunrise is a well-written story that takes us deep into the lives of two characters with very different personalities. While I enjoyed the first half of this book, the rest just didn't resonate with me. I liked their individual journeys, but not the way they merge together. As frustrating as I found this story, I think it's also a true representation of the teenage life.